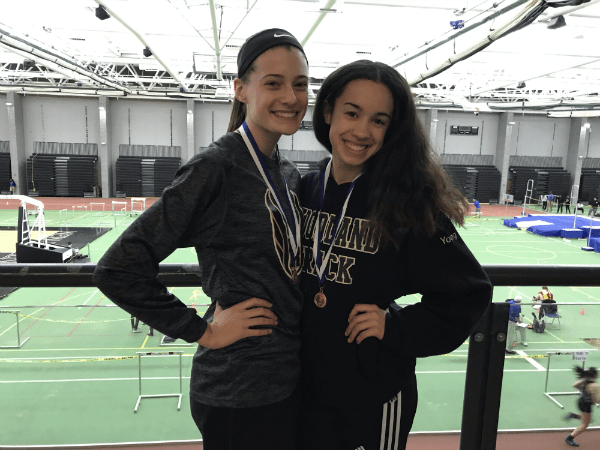 Jaden Young and Emma Slavin are very well known for their outstanding running skills. They’re both very hardworking and dedicated to what they do. Luckily, this hard work and dedication paid off, because they were both able to make it to the state open for indoor track this season. Young and Slavin both started their running journey with cross country in sixth grade at Long River. They were interested in trying new things so they decided to start running. They stuck with cross country throughout middle school, and loved it so much that they tried track in high school. They both became successful in the sport as well. Slavin has big plans since freshman year to make it to states.“I’ve always wanted to qualify for states,” Slavin explains. “That was kind of the big goal that a lot of people had.” Already by her junior year, Slavin has succeeded in her dream. She’s now focusing on running in college, which is something she would really love to do. Young, on the other hand, was focusing on breaking a school record. “Breaking a school record was kind of my goal, so I used that as motivation throughout the season,” says Young. Soon enough, Young was able to set a school record for the individual 800 meter race. Not to mention, this was only her freshman year, that was something most seniors haven’t done before. The two take the sport very seriously. At practice, they put in 100% effort, even for warm-ups. “I always make sure I have correct form, and I’m doing all the exercises so I can get the most out of everything I’m doing,” says Slavin. “Even though it’s nice to have fun with your friends, it’s always important to stay focused during practice,” Young adds. The girls have used these tactics in order to make it not only to state open, but NVLs and states as well. For Young, making it to state open for the first time was very exciting for her, especially since she is only a sophomore. “I was really excited about it because I didn’t think it was a possibility this year,” Young states. This really opened things up for her in the future, considering she has two more years of indoor track left. Not only did Slavin make it to state open for indoor track, but she also made it for cross country for the first time. “I think it’s so cool to be competing against the most stacked competition in the state, so I think it’s really special and I think it’s helped me become a better runner too,” Slavin says. Young had competed in the 1000-meter race with a time of 3:10, which put her in second place. She’s satisfied with her performance, but hopes to do better next year. “I think I did well, but I hope to to better next year,” Young states. It’s definitely possible for her to improve, especially with two more years of track to go. Slavin competed in the 1600 meter race, which is a mile run. She finished with a time of 5:29, which isn’t her personal best, but she’s still happy with how she did. “I didn’t run a personal best, but that was my second best ever, and so I thought it was a really solid race,” Slavin says. The two girls have been very successful over the past few years. Breaking school records, going to NVLs and states, and of course making it state open. Being able to attend all these big meets is something a lot of people would love to do. Their hard work and dedication since sixth grade has really helped them get to where they are now.